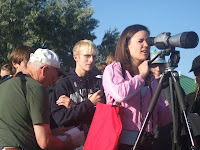 On Nov. 15th, Melissa and I went up to the Hogle Zoo to participate in their "Career Day at the Zoo" activities. 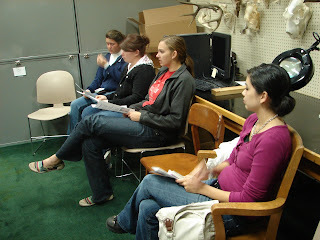 We went prepared to talk about careers in taxidermy and museum education, but it ended up that the only people there to talk to us were between the ages of 5-9 and they wanted nothing to do with the knowledge of how to preserve dead animals. Melissa and I figured that we were in for a day of boredom. However, we noticed that all of the other booths at the career day had treats to give out to people that visited them. So, Melissa sent me out for candy in order to bribe people to come take a look at what the Bean Museum has to offer. I returned to the zoo with bags and bags of candy. Suddenly, there were hoards of kids willing to visit our booth. 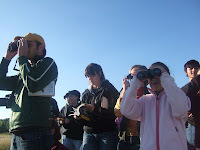 They would come over, take a quick look at the animals we had brought, grab candy, and get on their way. This was all well and good, but we were up there to promote the museum and if we never got the opportunity to talk to anybody, we weren't doing any good. So, we had this GREAT idea to get people to come near us. 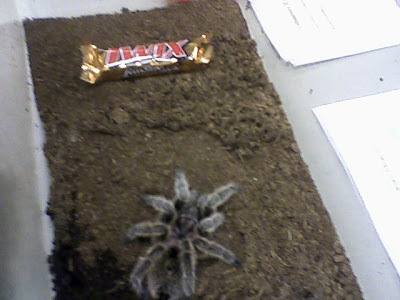 Melissa slowly lifted the lid on Rosie's (the tarantula) cage and placed a candy bar in with her. 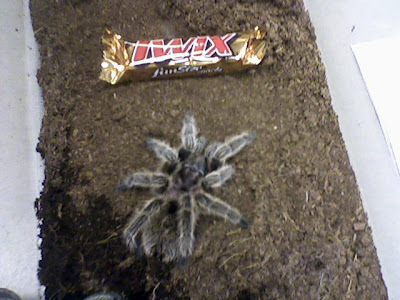 Now, instead of people grabbing and go, they had to debate within themselves if a miniature Twix bar was worth possibly getting attacked by a rather cute tarantula. They would come over, see the tarantula, decide that there was NO WAY that they were going to go for it. However, since they had walked ALL the way over to our booth, they started to ask us questions. "Where is the Bean Museum?" "Is it free?" "What kind of activities do you have for 9 year olds?" Finally, someone grabbed the candy bar! Once this little boy gathered up strength and reached into that cage, dozens of other children found their courage and followed in suit. 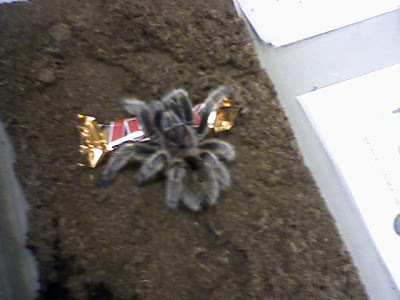 Melissa decided that it needed to be harder, so soon the candy bar was actually UNDER Rosie. Many people decided that this was the scariest thing that they had ever been put up against and didn't dare go for it. However, since we had created this "game" our booth was the most popular at the career fair and we turned a potentially waste of a day into a productive Bean Life Science Museum promoting experience. 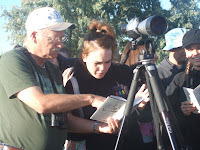 At 10 am on Saturday, October 25, Amanda Owen and five college students piled into a university van and hit the road to go see a flesh eating beetle colony. I must admit that I wasn’t sure what to expect. Was this going to be like a scene from The Mummy? What if they escaped and started eating the students? 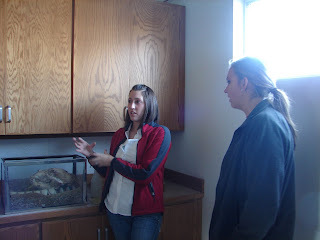 And what on earth was a colony of flesh eating beetles doing on BYU campus? As it turned out, there was nothing to worry about. The flesh eating beetles (aka Dermestid Beetles) are tiny – just smaller than a housefly – and it isn’t even the beetles that eat flesh. It is the larva. Once they turn into beetles they only live for a few days, just long enough to lay eggs, and then they die. Their entire life cycle only takes 45 days! 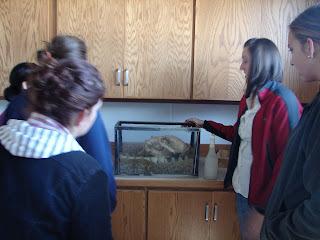 The colony lives in several small terrariums in a dark humid room at the old BYU stables. 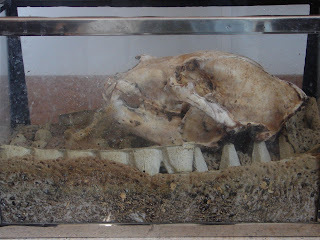 The Bean Museum uses them to clean the flesh off the bones of animals. 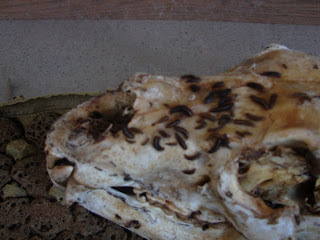 The beetles actually get the bones cleaner than boiling or bleaching would and they leave the entire skeleton intact. Even the smallest vertebrae on the tail of a mouse is still attached to each other by the time the beetles have finished with them! And as for the problem of the beetles escaping, that is easily solved. Occasionally they do find their way out of the cage but they are attracted to water. Amanda told us that all you have to do is leave a small cup of water on the floor overnight and by the next day all the beetles will have come home. 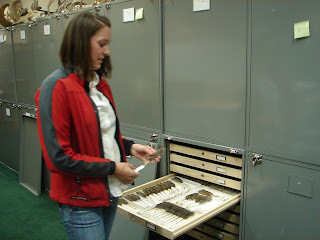 After we finished looking at the beetles we traveled back to the museum where we took a tour of the mammal collection and learned about how animals are collected, prepared and cataloged. 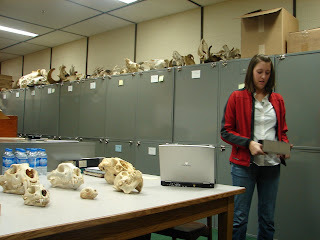 Amanda showed us some different animal skulls and let us guess what type of animal they came from. 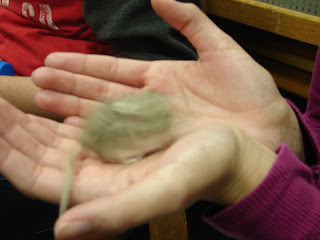 Then we looked at a Kangaroo Rat and we even got to hold a Kangaroo Mouse that lives at the Museum. 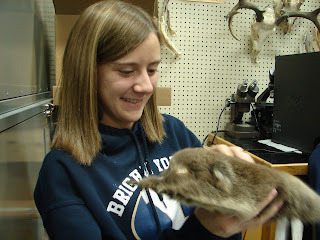 Amanda also showed us some of the more unusual animals that are housed in the collection, such as a vampire bat, and echidna and a duck billed platypus. 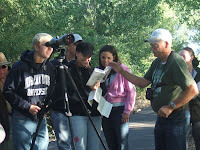 Overall, everyone had a good time, learned something new, and gained a new appreciation for creepy crawlies. 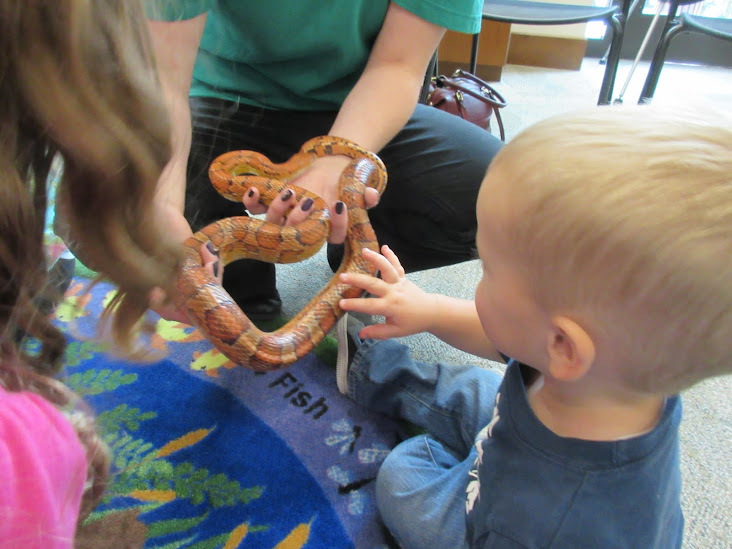 This past Monday almost 500 people participated in the Bean Museum’s Halloween Family Night. 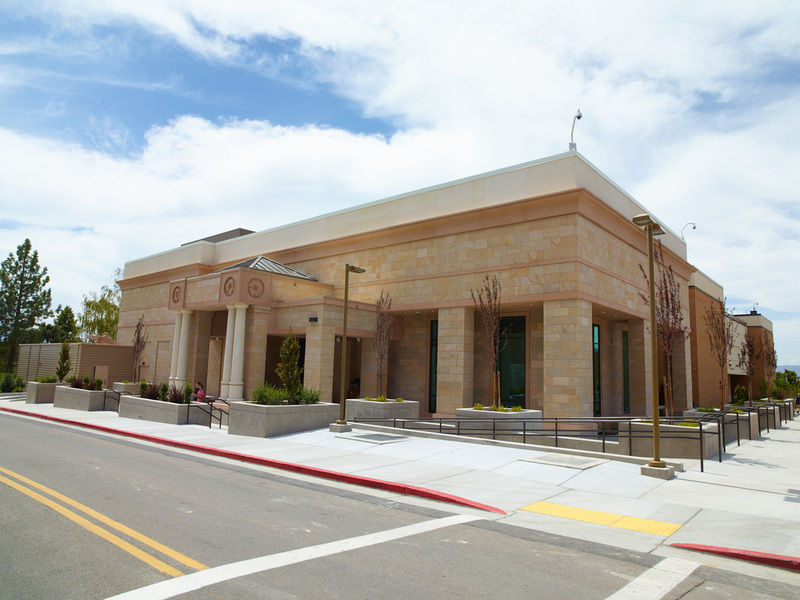 The museum was swarming with kids dressed up as lions, dinosaurs, princesses, ladybugs, and even more. Brent, a museum educator dressed up in a suit entirely made of ducked tape, gave awesome live animal shows specifically written for Halloween. 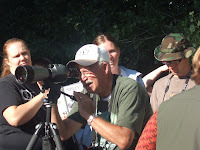 He taught everyone about brain coral, snakes, owls, bats. Everyone watching the show got to touch Rosy the live Tarantula. After the show, Tashina told spooky stories about a magical belt that turned humans into foxes and the legend of the werewolf. The museum also had creepy crafts which were extremely popular. Together families made Halloween masks, black roses, and spider webs. The kids loved the crafts. 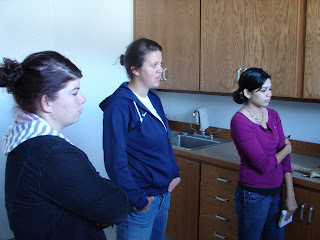 After hours educators gave tours of the museum in the dark. Each tour guide had a flashlight and told stories about different animals in the museum. 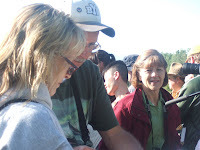 There were so many people signed up for the tours that we had to have four groups, each with 20 people! 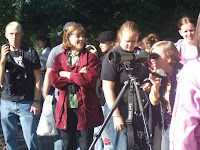 Bright and early Saturday morning (10 am – early for college students) five University biology students and I (Kortni – a Museum Educator) gathered at the Bean Museum for a Nature Experienceship. 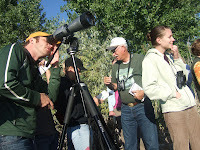 The fish experts (Peter, Josh, and Justin) took us up Spanish Fork Canyon to search for different species of Utah fish. Walk upstream putting the metal ring of the fish shocker into the water. Don’t touch the water with exposed skin! It will hurt (but not injure). Observe the water for stunned fish and when you see one catch it with the net. Put the fish in a bucket, look at what type of species it is, take a picture with the fish, and then put it back in the stream. 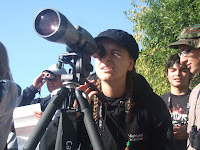 The whole experienceship was pretty amazing. 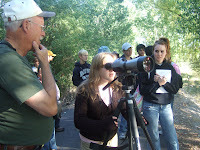 The weather was great; the fish experts were hilarious; and all of the students seem to enjoy touching with stunned fish. 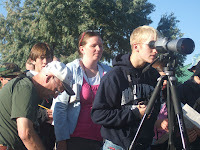 We had 25 people and 25 spots in the three BYU vehicles we took on our bird watching field trip this morning. 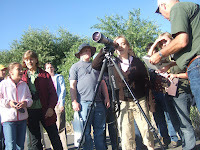 We saw a total of 22 birds in two hours and most of the birds were very cooperative and stayed put so that all 25 of us could get a good look - they must have gotten my memo (I told them we were coming). 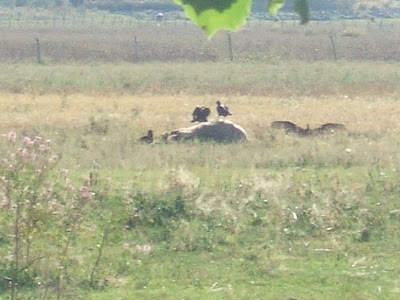 One of the highlights was watching these Turkey Vultures on this dead cow.